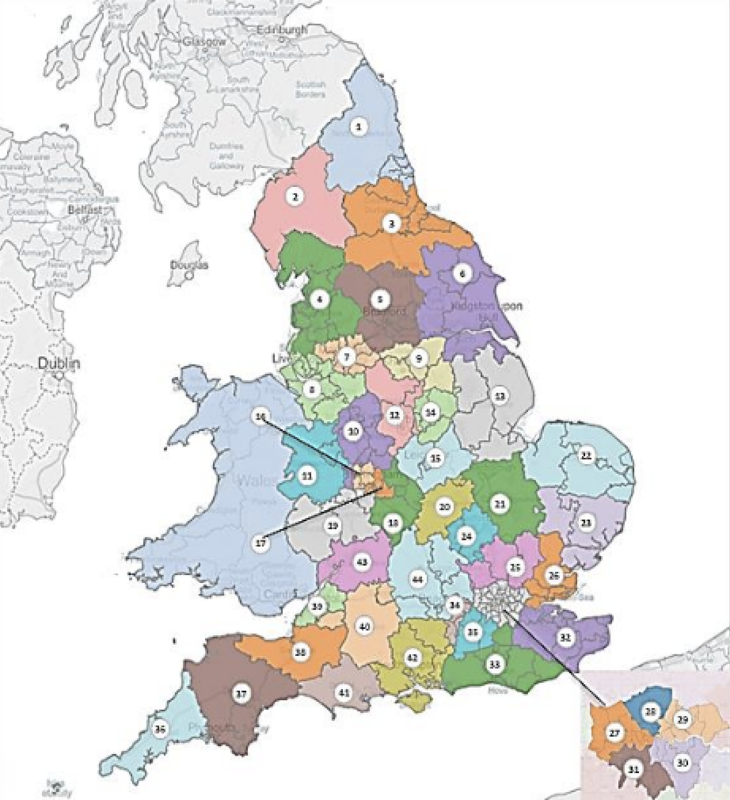 The 44 STP footprints in England. With health systems globally facing new and complex challenges, transforming the way services are organised and provided to meet rapidly changing needs has become a major preoccupation of policy-makers. The UK is no exception although the resistance to current health system transformation efforts is especially evident in England. Arguably, the rest of the UK seems less hostile to transformation and less compelled to seek out conspiracy theories or devious schemes to privatise or dismantle the NHS. While such theories and schemes may not be entirely without substance, all too often they become an excuse for not transforming the NHS but rather for seeking to preserve it in some utopian ideal state. But if one looks more closely at the transformation agenda being rolled out across the NHS, things are rather more complicated. Underpinning the transformation agenda is the notion of the Triple Aim developed by Don Berwick, no destroyer of the NHS, and colleagues at the Institute for Health Improvement in Massachusetts. Improving health systems requires the simultaneous pursuit of three aims: improving the health of populations, improving the experience of care, and reducing per capita costs of health care. The NHS currently does not meet the Triple Aim’s challenges – and most lamentably not in population health which has barely figured in the NHS since its creation nearly 70 years ago. Remember the Wanless reports from 2002 and 2004 which accused the NHS of being a sickness service and of paying far too little attention to public health? As the opening paragraphs of the NHS Five Year Forward View (5YFV) rightly noted, despite the government endorsing Wanless’s fully engaged scenario, it was never implemented. Only now with public health back in its rightful home in local government is there the prospect of a whole systems or place-based approach to health taking root. In many cities, including Coventry and Newcastle, the Marmot Six (the key policy priorities covering the life course as set out in Michael Marmot’s 2010 review of health inequalities in England, Fair Society, Healthy Lives) are informing health and wellbeing strategies and being implemented. Of course the overall political and economic climate is hostile and hardly conducive to, or helpful in, meeting the enormity of the challenge but the 5YFV is a start and discussions are being held and initiatives are being put into practice which just didn’t happen when public health struggled for a place in the sun, eclipsed for the most part by the big beasts in the NHS jungle, namely, the acute hospitals, especially those with Teaching and/or University in their titles. Raids on public health budgets were commonplace. What the transformation agenda has given permission to do is allow local areas to chart their own destinies within a national framework. It is too early to draw on the results of the many evaluations underway of the Vanguards and New Care Models (NCMs) that have sprung up across the country. But those close to the action locally and involved in local evaluations, including a research team led by Durham, Newcastle and Northumbria Universities examining the impact of the five North East Vanguards, are impressed by the enthusiasm and seriousness with which issues that have dogged the NHS for decades are being confronted and new ways found of breaking the logjam. There will be failures but hopefully important lessons can be learned from them once the numerous evaluations underway start to report their findings. There are also risks and doubtless those on the lookout for attempts at dismantling of the NHS will be rewarded by finding examples of suspect developments that might appear to undermine NHS core values. At the same time, much of the thinking behind the NCMs, and more recently the Sustainability and Transformation Plans (STPs), is actually seeking to achieve what critics of the ill-fated and badly designed Health and Social Care Act 2012 have been at pains to point out. The Act had three deep-seated flaws. First, it once again repeated the mistakes of earlier reforms which focused on structure, not culture. Second, it encouraged competition at the expense of collaboration. And, third, it encouraged fragmentation when what was needed was integration. Rather than inflict yet another major, costly, and almost certainly misconceived, top-down structural change on a beleaguered service, the changes triggered by the 5YFV are aimed at bypassing the worst excesses of the 2012 Act and, in their place, restoring a degree of order and stability that was being rapidly lost. A little noticed, but welcome, feature of the work on STPs is that they spell the end of the purchaser-provider split which has become something of a religion to health policy-makers in England. Scotland and Wales saw the light many years ago and abolished the separation but England has been slow to heed the evidence demonstrating what a waste of time and resource retaining it has been. The transaction costs alone have been significant with no appreciable gain in improved performance or outcomes. No one would deny that the process of giving birth to STPs has been painful and much work remains to be done to get them into shape that both connects with the public and stands a reasonable chance of success. But STPs are a journey and not a set of plans of the type which the NHS used to be famous for. They are dynamic and will change and adapt as they are progressed and adapted to local circumstances. Moreover, despite the misleading name, they are less about planning and more about implementation. Another significant feature of STPs is the process they have unleashed. For the first time in the NHS’s history, local government and other key stakeholders are part of a local conversation to identify and meet the health and health care of their communities. The timing is not ideal, the timetable is too rushed, and the resource climate is desperate. And yet, undeniably, the sense of urgency and the horrendous resource pressures have been important drivers of the change process. The opportunities available to engage and influence the outcome must be embraced by all. As the STP juggernaut gathers pace, progressives across the political spectrum must of course retain and focus their critical gaze on what is happening to the NHS. But they should also seek to acknowledge and build on what is good about the changes which are long overdue and show some promise. Of course more money is needed and the March budget went some to acknowledging this by releasing £325 million over three years for capital investment for the strongest STPs. However, ultimately what STPs are trying to do is not about money. What they have created space for is the opportunity for all NHS staff to exercise their creativity and find solutions to problems that have largely been ignored or side-stepped. And many of those staff are relishing the opportunity to redesign services and better meet the health and care needs of their populations. The latest King’s Fund review of STPs provides evidence of this ferment of activity. And a message from our evaluation of local new care models is that improving the quality of care and life for people in care homes is possible. Innovative public services should not be regarded as an anachronism or as something only the private sector can do. We know this is a myth – the NHS is an ant-heap seething with innovation. But the myth takes on meaning when every attempt to reconfigure the NHS is condemned as having sinister or suspect motives. A more nuanced and balanced critique is called for if the opportunities presented by STPs are to be seized and capitalised upon.